Microwave meringues in only minutes! 1.Beat egg white lightly add powdered sugar knead until the mixture is a thick, pliable icing and roll into balls. 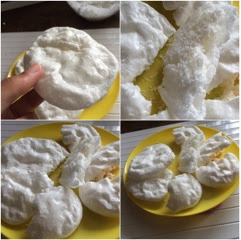 2.Line a plate with kitchen paper put 2 balls at a time on the plateand microwave them on 720w for 1 min 20 sec and watch, in amazement, as the balls balloon and puff into meringues. 3.Allow to cool and remove from kitchen paper.